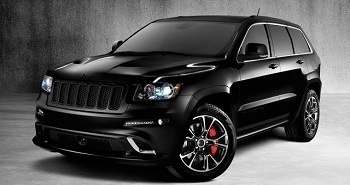 Jeep is working on a new version of their very successful Grand Cherokee called Trackhawk. The Trackhawk is supposed to be to street performance what the Trailhawk is to off road ability. It has had its problems and there were rumours of delays but it is on track (pun intended) and is set to launch in 2016 at a cost of £52,379.16 ($80,000). Its supercharged Hellcat V-8 paired with four-wheel drive, 6.2-litre, 707 horsepower and 650 pound-feet of torque could help the Grand Cherokee breach 60 mph in less than four seconds. Latest rumour is 0-60 in 2.7 seconds. Base 475-hp Trackhawk models will come with the naturally aspirated 6.4-liter V-8 that is used in today’s Grand Cherokee SRT. Its main rivals would be the BMW X5 M; Land Rover’s new highest-performance model, the Range Rover Sport SVR; Mercedes-Benz ML63 AMG; Porsche Cayenne Turbo S.
There are concerns over how long the V8 will be available for, as there are new regulations coming in for companies to achieve a level of miles per gallon that cannot be achieved with V8’s. These new rules and reg’s will come into effect around 2017 – 2018 which only leaves a small window to get a Trackhawk.